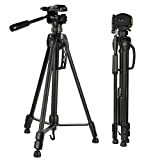 3-section, lever-lock legs for easy height adjustments; zippered storage bag included; Centre column design with a hook to used as counter weight to increase stability; Durable quick release leg flip locks. This entry was posted in Discount Photography and tagged 3Way, Alloy, Aluminum, Black, Camera, Cameras, Canon, Capacity, Concept, DSLR, Fujifilm, GoPro, Head, Lightweight, Load, Nikon, Olympus, Panasonic, Pentax, Plate, Portable, Quick, Release, Sections, Sigma, Sony, TL2023, Tripod by Ball Photo. Bookmark the permalink.